The Strong Players Online Tournament (SPOT1) launches tonight, April 23, at 7P on KGS, with three matches between U.S. players, as well as six Canadian players battling for three slots in the Top 32. The first major online open tournament in recent years has attracted a lot of interest from players and fans alike. 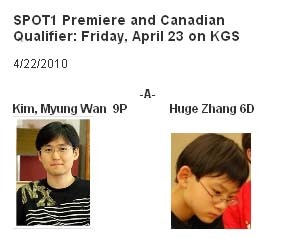 Among the thirty-five strong players from Canada, the United States and Mexico are Korean 9-dan professional — and two-time US Open Champion — Myung Wan Kim, Canadian Yongfei Ge 7D, also a two-time US Open winner, and 2006 NAIM Champion Zhaonian “Michael” Chen 7D from New Jersey. “Every team is tough,” said Yixian Zhou 7D from Los Angeles, better-known as “missbear” on KGS. “But I will have fun to learn from the strong players.” Changlong Wu 7D from North Carolina encourages fans to “Come and watch, and join the AGA today.” The tournament continues over the weekend. Click here for the pairings. schedule and results. Four players with identical 4-0 records topped the three divisions of the Salt City Go Tournament, held April 17 in Syracuse, NY. Gus Price 7d (at right, in photo) took the $200 top prize in the A division, while Peter Wynn 4k took first in B. Dan Young 18k and Meg Houston 29k, both playing in their first AGA tournament, tied atop the C division. 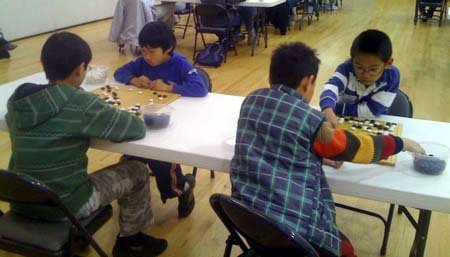 12-year old Yao Zhou 6d (at left, playing Price) took the second-place $75 prize with a 3-1 record. A record 32 players competed in the tournament, which was the third paired tournament held by the Syracuse Go Club, with cash prizes of $400 along with 13 books from Slate and Shell. 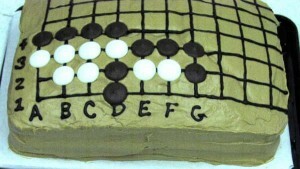 The tournament’s go problem cake (B to play), a 3-year tradition at the tournament, drew 15 solution submissions this year (only four correct), with Noel Kinnear of Schenectady, NY winning a book prize. 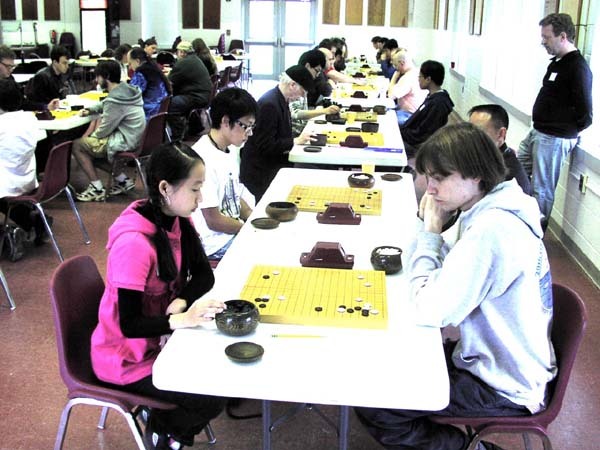 David Tang 2d led the dan division with a 3-0 result at the Bay Area Go Players Association’s monthly ratings tournament in Palo Alto, CA, on April 10. Kfir Dolev 5k (r) and Larry Qu 6k each went 4-0 to top the kyu division. Anthony Chiang 2d earned an honorable mention for completing a whopping ten games, a dan division record. “Our flexible tournament format lets people play as many or as few official games as they like,” explains tournament organizer Roger Schrag. Twenty-nine adults and children played, ranging from 24k to 5d, with eight of the 29 playing in their first tournament ever. Click here for more photos. Next month’s ratings tournament will be held May 2 in Oakland, CA. Karlruhe increased their lead over runners-up Hamburg Hebsacker on April 15 in the penultimate round of the German Bundesliga (Team League). Hebsacker won on only one board of four, just enough to keep their hopes alive for a miracle next month. They would not only need to crush the Frankfurt Dragons, but Karlsruhe – which has won the title all but one year – would have to lose badly to Berlin Igoist, for Hebsacker to win their second national title. Igoist defeated the Dragons to take over third place from Hamburg Pauli, which also lost 1-3, to Kieloben of Kiel. In tenth place, the aptly-named Berlin Blunders are beyond hope, while Red Star Nuremberg in ninth needs a win over Pauli to stay in the top league. While Europe was closed for air traffic last weekend due to the ongoing volcanic activity, the 2010-11 Pandanet Tour launched in Bled, Slovenia, which the players — who hail from Central Europe — could reach by car. Ondrej Silt 6d swept all six rounds of the Tour’s first tournament April 16-18, while Pal Balogh 6d won five for silver and veteran Vladimir Danek 5d’s four games earned him bronze. The same names topped last season’s tour, which ended last month in Paris. The season opener, the Vladimir Omejc Memorial, attracted 41 participants, of whom youngsters Luka Camernik 1d and Nenad Denadic 7k – both of Slovenia – also did well with 5-1 each. Willem-Koen Pomstra 5d of Arnhem won all rounds to take first place in the Martini Cup April 17-18 in Groningen, The Netherlands. Herman Hiddema 4d of Delft lost only once, to take second place. Torsten Knauf 4d of Cologne finished third with three wins. In Groningen 46 took part. Also Hakan Dagli 3k of Almere and Maria Nyström 7k of Umela won all five of their games. Young-sun Yoon 5P provided game commentaries. The tournament’s name derives from the Martini Tower, which dominates the city’s historic center. Victory in this year’s dramatic Transatlantic Youth Go Match (TYGM) hinged on the tiebreaker that had to be played after the teams from North America and Europe tied at five wins each. The tiebreaker captain’s game between Curtis Tang, who has represented the U.S. many times at the World Youth Go Championship (WYGC), and Artem Kachanovskyj, a perennial contender at the WYGC for Europe , handed victory to North America again – the team won 6-4 last year — when Tang was able to hold onto his lead through the endgame. Over 600 online spectators showed up Sunday, April 18 to watch the TYGM’s second edition, in which twenty players from ten countries in North America and Europe played in a friendship exchange between the two continents. The success of this event, both last year and this year, ensure that it will continue to be a venue for North American and European players to mingle and make new friends. Full details and game records can be found here. 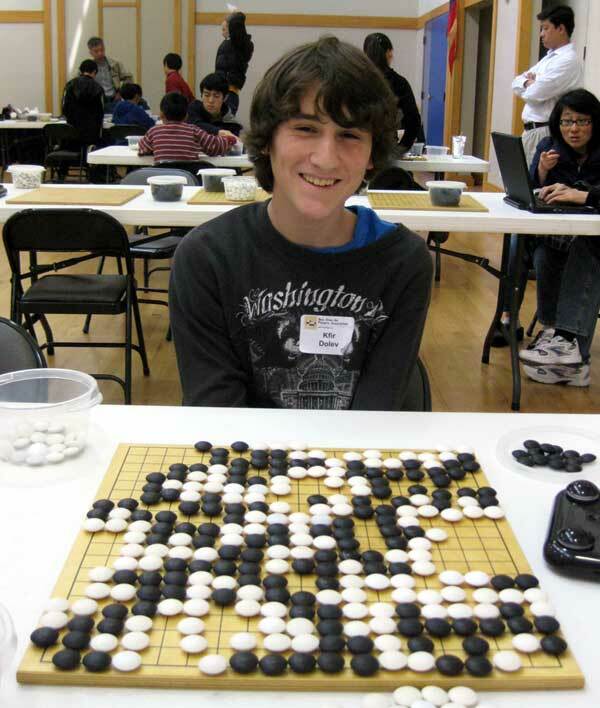 Trevor Morris 7D took first place out of 30 players in the Massachusetts Spring tournament, held April 11 in Somerville, MA. In second place was Pete Martin 4k and Matt Mallory 1k was 3rd. Thirteen-year-old Calvin Sun 7d and ten-year-old Kevin Fang 1d won their divisions at the World Youth Go Championships qualifiers on April 10 and 11. In the Senior Division, Sun faced stiff challenges from Curtis Tang 8d and Zhongxia Zhao 7d. Zhao bested Tang in the semi-final, but then lost to Sun at the finals. The qualifier was held on KGS, and drew over 300 viewers on the top boards. In the Junior Division, all four youth happened to live in the Bay Area and were able to compete live at the Bay Area Go Players monthly ratings tournament. In the first round Aaron Ye 1d, 7, was top seeded, but lost to Sammy Zhang 1d (9), while Kevin Fang 1d (9), beat out Henry Zhang. Fang and Sammy Zhang faced off in the finals, with Fang emerging the victor. Both boys will be off to Taiwan to compete in the World Youth Championships in July, along with their teacher and team coach Mingjiu Jiang 7p. The US Youth Go Championship, now separated from the World Youth Go Championship, will feature both regional and online qualifiers over the next few weeks. Boulder and Chicago are both holding events on April 24th, and the American Go Honor Society (AGHS) is hosting an online qualifier on May 1st. The finals, on June 5 and 6, will determine National Dan, Single Digit Kyu (SDK), and Double Digit Kyu (DDK) Champions. Any youth living in the US may enter, citizenship is not required. The winners will receive trophies, and prizes will be awarded in the following brackets: 1-5 dan, 1-4 kyu, 5-9 kyu, 10-15 kyu, 16-20 kyu, 21-25 kyu, 26 and up kyu. Contestants will also receive free audio go lessons courtesy of Guo Juan 5P.